In 1870 a number of Masons meet regularly at the Knickerbocker Cottage, a restaurant in Manhattan for lunch. An idea was brewing to form a new fraternity in which fun and fellowship would be stressed instead of ritual. 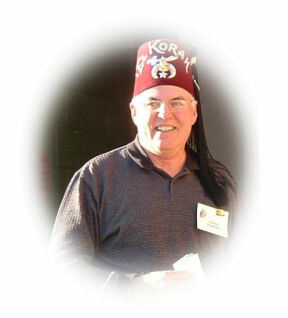 From this beginning the current Shriners of North America evolved. Two Masons, Billy Florence (an actor) & Walter M. Fleming (a medical doctor) were the key figures in getting the Shrine started. By the 1920's the Shrine was unstoppable, spreading to Canada, Honolulu, Mexico City, and the Republic of Panama. During this same time there was growing member support for establishing an official Shrine charity. From this came the idea of a Shriners Hospital for Crippled Children. The cornerstone was laid by June of 1922. The hospitals have since changed their name to Shriners Hospitals for Children to reflect the widening scope of their service to children and their research program. Today the system consists of 22 hospitals providing care for orthopedics, burns, and research. Recently an additional program has been added to meet the needs of children with cleft palate disfigurements. For more information you can read the Shriner Primer. One of our Minot Shrine Clubs members, Marty Boser did a little "horse trading" and we ended up with a beautiful, valuable, useful, pull-type, enclosed trailer that will be used for many years, and all at a bargain price. The sides of the trailer are now decorated with graphics that advertise our Northwest Shrine Circus and a few of our own clowns' pictures. The trailer made its debut at the Minot State University's Homecoming Parade accompanied by Shriners and it looked great. We plan to use it in many parades. Three Members of the Minot Shrine Club’s Merrymen unit were presented the Prestigious Red Nose Award by Minot Shrine Club’s President Robbie Roberts at the February 2009 monthly Shriners Noon Luncheon. Ken “Dizzy” Gillespie, Chuck “Buddy” Wathen, and Orren “Buttons” Anderson received the International Shrine Clown Associations symbol of appreciation for their generosity of effort and purpose. If this sounds like last years news - you are right - the same three Merrymen received Red Nose awards before, however, these are not awards that mean the job is done. They have to be earned every year. To join the extremely small group of North American Shrine Clowns that achieve this award, each clown must perform over 150 hours in clown makeup at Shrine Parades, Shrine Circuses, or other Shrine activities and have raised and donated contributions in excess of $150.00 to the Shrine Hospital Burns research fund via the “Sneaker Fund”. In 2008 they raised and donated in excess of $1,700.00. They quit counting the hours after they attain 150 hours. This year Orren “Buttons” joined a very exclusive group by receiving the 1st time Gold Nose Award for having been awarded five previous Red Nose Awards and qualifying again in 2008. Chuck “Buddy” Wathen will get his gold nose this year, and Ken “Dizzy” Gillespie is well on his way to the second Gold Nose award. These Shriners are very proud to represent the Minot Merrymen unit, the Minot Shrine Club, and Kem Temple and expressed thanks to all members for the support they received. 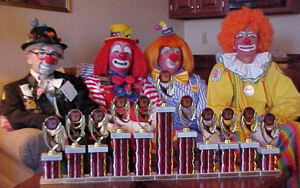 In August of 2004 these Minot Merrymen clowns were resting and posing with the awards they had received in the Midwest Shrine's Clown Unit competition in Sioux Falls SD when Nobel Paul "Gizzmo" Zaharia suggested a way that they could capture the moment. 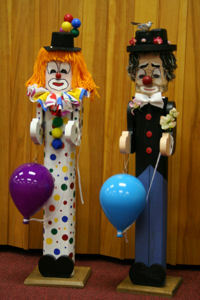 His idea was to make small replicas of the clowns as wooden figures. Since his mother had crafted similar dolls he thought that it would be a quick and easy project. Paul started the project right away but had to set it aside for other more pressing matters. Finally (masterpieces aren't created overnight) he was able to get back to the project with the help of his wife, Margaret, and mother, Sophie, and finish the now expanded production of the 30 inch high clones in February of 2009. Seated left to right in the top photo are Richard "Happy" Glessing, Ken "Dizzy" Gillespie, Paul "Gizzmo" Zaharia, and Orren "Buttons" Anderson. They are in the cloned photo. 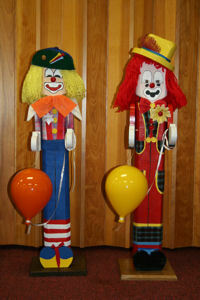 The two other"clones" represent Merrymen Shrine Clowns Gary "Duffer" Angel and Charles "Buddy" Wathen. Any Shrine clown interested in having himself cloned can contact Paul. Our own Ken "Dizzy" Gillespie brought home great honors for Kem Temple and the Minot Shrine Club by representing us in the competition at the International Shrine Clown Association's Mid-Winter Convention held in Atlanta, Georgia in February of this year. 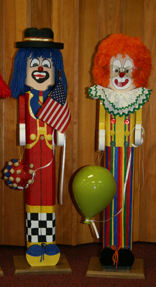 Ken was awarded 1st runner up for Clown of the Year among all the Shrine Clowns in North America for his efforts in 2008. In this year's competition he won 1st place in the most important category of clowning for Shriners -- the Paradeability Award. This contest judges how well a Shrine Clown can get the attention and entertain the crowd while moving in a parade. Ken also won 2nd place in the One Man Skit, 3rd place in the Balloon Sculpturing Contest, 2nd place in the Two Man Skit, and placed top 5 in the Clown Extraordinaire, which is the contest between only the top winners from previous regional International Shrine Clown Association contests. Ken was very proud to represent Kem Temple and the Minot Shrine Club. He wishes to thank everyone for their support. He especially wants to thank his unit, the Minot Merrymen, and the other Kem units that helped him to make the trip to Atlanta. Charlotte Griffin (center photo) donated 20 teddy bears to children at the Minot Shriners 2007 Annual Children's Party at the Masonic Building December 8. Charlotte's husband had given her a Wal-mart or KMart teddy bear each year from 1980 - 2000 before he passed away. She wanted to give the teddy bears to some very special children-- those that had received treatment at the Shriners Hospitals. To see more photos from the Christmas Party, click here or on Album 2007 in the box at the bottom of this page. 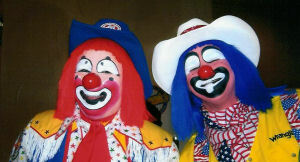 Ken Gillespie Dizzy and Chuck Wathen Buddy competed in the highest category Clown Extraordinary because they each won top three places in the last International Shrine Clown Association (ISCA) Competition at Calgary Alberta , Canada . This means they had to go against North Americas' greatest ISCA Clowns (winners against winners) in the competition at Springfield . The top five will have to stay in the Clown Extraordinary category for the next ISCA Competition. Ken won top five status, 2nd place in the one man skit, and top 10 in the two man skit. Chuck was successful in placing in the top ten in the one man and the two man skit. Not only do these two Nobles bring credit to the Minot Shrine Club and Kem Temple by their efforts and accomplishments in the ISCA, but also in their service as presidents of the Minot Shrine Club (Ken) and the Minot Merrymen (Chuck). 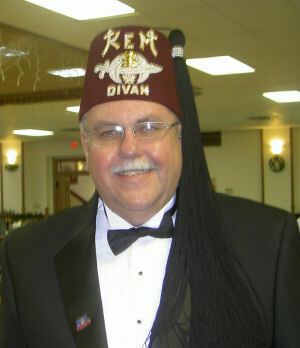 David E. Witter, Minot, ND was elected and installed as the 95th Potentate of KEM Temple on Saturday, January 13, 2007. 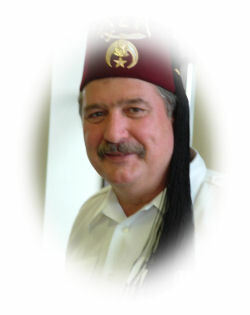 As KEM Potentate and highest elected officer, he will direct the activities of Shriners in the northern half of North Dakota and northern half of Minnesota. Witter was born and educated in Shippensburg, PA. He entered the U.S. Air Force in 1953 and retired in 1983 at Minot Air Force Base. While in the military he worked in the aircraft maintenance field as an aircraft electrician and an aircraft production scheduler/controller. He was also a first sergeant and obtained an Associate Degree in Production Management. He worked in Civil Service at Minot Air Force Base from 1984 to 1997. He also worked at Minot's UniMed Hospital in Materials Management from 2001 until 2003. 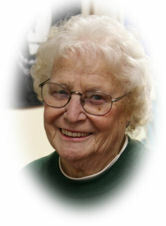 Witter has five children, nine grandchildren, and one great grandchild. Witter is a member and Past Master of Star in the West Lodge #33 in Minot, a dual member of Ashlar Lodge #69 in Granville, ND, a member and past Secretary of the Minot Scottish Rite Bodies where he holds the honorary 33rd degree, member of the North Dakota York Rite, member of the Minot Merrymen, Minot Motor Patrol, KEM Rougnriders Clan #172, Ancient Order of Camel Herders, National Sojourners and a life member of VFW Post #753, Minot, American Legion Post #223, Shippensburg, PA, Minot Shrine Club, a member of 40 et 8, Voiture #360 of Williston, ND, and a member of Moose Lodge #822 of Minot, ND. Witter is a member of Our Lady of Grace Catholic Church. 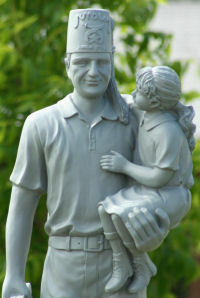 He is retired and enjoys golfing and hunting with his buddies and spending time with Kay and their friends at their summer place at the lake. 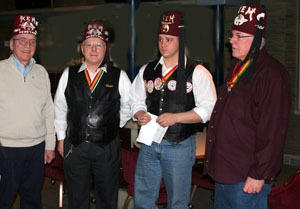 Three Members of the Minot Shrine Club's Merrymen unit were presented the prestigious Red Nose award at the Kem Temple Annual Meeting on January 13, 2007. Ken Gillespie, Chuck Waltham, and Orren Anderson received the International Shrine Clown Association's symbol of appreciation for their generosity of effort and purpose. To achieve the award each performed over 150 hours in clown makeup at Shrine parades, circuses, and other functions and raised contributions that far exceeded the $150 requirement for donations for the Shriners Hospital Burns Research. Stanford Morris Ootz President of the International Shrine Clowns of America presented an award of appreciation to the Minot Merrymen for their efforts in raising over $1500 for the Shrine Burns Hospitals research. This money is donated to the Sneaker Fund when Shrine clowns perform. 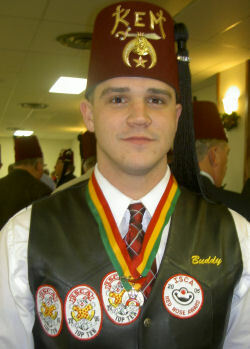 Minot Shrine Clubs' Merrymen Unit was select from all the units of Kem Temple to be awarded the Honor Unit of 2006. This highly coveted award is given to the Unit that by their accomplishments, have brought great credit to Kem Temple and the Shriners organization. The award was presented by the Potentate at Kem Temple 's Annual Meeting. 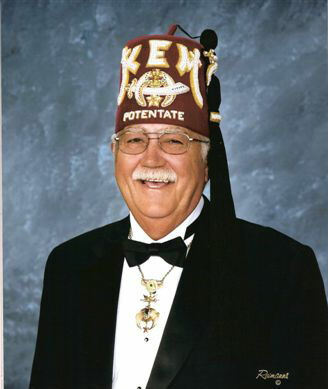 Minot Shrine Club's Jim Clifford was appointed to the Kem temple Divan by Illustrious Potentate Dave Witter. Minot Shrine Clubs' Tony Prough and Robbie Robertson have been selected to be Potentate's aides by Kem Temples Illustrious Potentate David E Witter. Their job will be to help the Potentate accomplish the good work of his office for the coming year. Chuck Waltham, President of the Minot Shrine Club's Merrymen Unit was given the Kem Temple SAMSAR medallion and ribbon by Illustrious Potentate Tom Moe for distinguishing himself within his Temple, his Shrine unit, and his community. 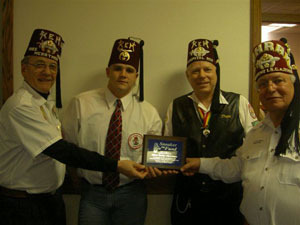 The award was given at the KEM Temple Annual Meeting, January 13, 2007. Minot Shrine Club's Ken Gillespie will serve as the new Kem Temple Representative. One of his duties will be to create and coordinate Shrine Hospital screening clinics in northern North Dakota and northeastern Minnesota. 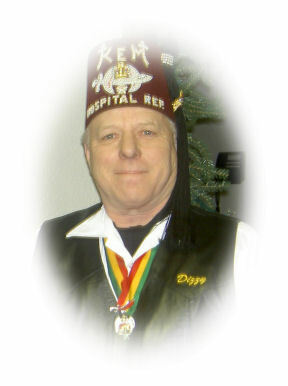 Ken will continue to serve as hospital representative for the Minot Shrine Club.